I know all about those California violets.! To me a good deal of California3 is like those violets – a pretty show, but somehow nothing very moving underneath the color. The ones you sent me on Christmas Eve perfumed the whole room when I opened the box, and kept their sweetness for several days. By the way, in trying to clean out my desk lately, I found an envelope marked "For Roscoe – After Elizabeth's4 Visit". Now, this visit must have happened many months ago, and these two clippings about "Sapphira5" I especially wanted you to see. I will send them now, as they might interest you. 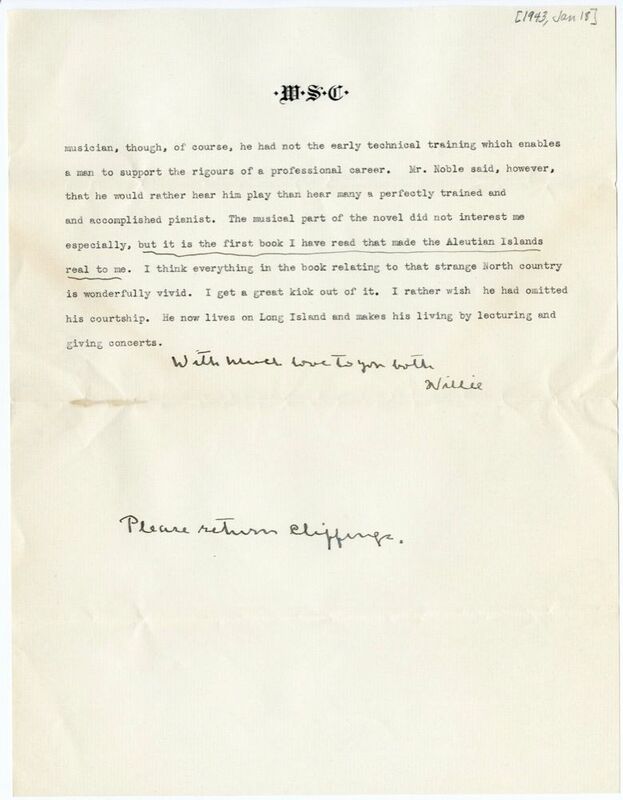 I was particularly surprised at the one signed6 by William McFee7 Macfee. McFee is the "nautical editor" of the New York Sun8. He is an Englishman and has long been one of the best writers on naval matters. 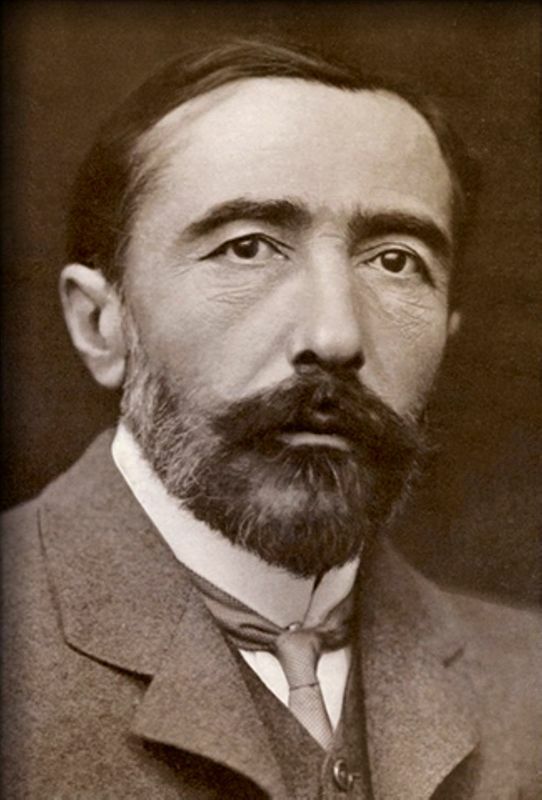 Long ago I wrote him a rather impertinent letter, rebuking him for some of his criticisms of Joseph Conrad's9 knowledge of seafaring. I have long been ashamed of yielding to that impulse and have always supposed that he was no friend of mine. I think it very noble of him to forgive my youthful impatience, and to write so gravely and courteously. He himself has written several nautical novels, which were pretty dull in spite of his vast knowledge of naval matters. I first heard of the author10 of "Son of the Smoky Seas"11 through Tertius Noble12, the organist at St. Thomas' – the most fashionable church in New York13. He was organist at St. Margaret's in London14 – St. Margaret's is the old church which stands in the enclosure of Westminster Abbey – Chaucer15 died there. Mr. Noble came over here during the first World War. He has been a prominent influence in music here ever since. He told me that this queer fellow was is really a remarkable ·W·S·C· musician, though, of course, he had not the early technical training which enables a man to support the rigours of a professional career. Mr. Noble said, however, that he would rather hear him play than hear many a perfectly trained and accomplished pianist. The musical part of the novel did not interest me especially, but it is the first book I have read that made the Aleutian Islands16 real to me. I think everything in the book relating to that strange North country is wonderfully vivid. I get a great kick out of it. I rather wish he had omitted his courtship. He now lives in Long Island17 and makes his living by lecturing and giving concerts. McFee, William (1881-1966). British-American mariner, nautical writer, and book reviewer. Born on board the ship captained by his Canadian-born father, William McFee went to sea as a mechanical engineer in 1906. He combined writing nautical books with work as a nautical engineer until 1923, when he settled in Roxbury, CT, and devoted himself full-time to writing, including writing book reviews for the New York Sun and the New York Times. Oliver, Simeon (1902-1983) (“Nutchuk”). American author, lecturer, and organist. Born in the village of Chignik on the Alaska Peninsula to a Norwegian fisherman father and an Inuit mother, Simeon Oliver’s father placed him at the Methodist Mission on Unalaska Island in the Aleutians after his mother died giving birth to his sister. Oliver began playing organ by ear at age five and was taught to read music at age ten. 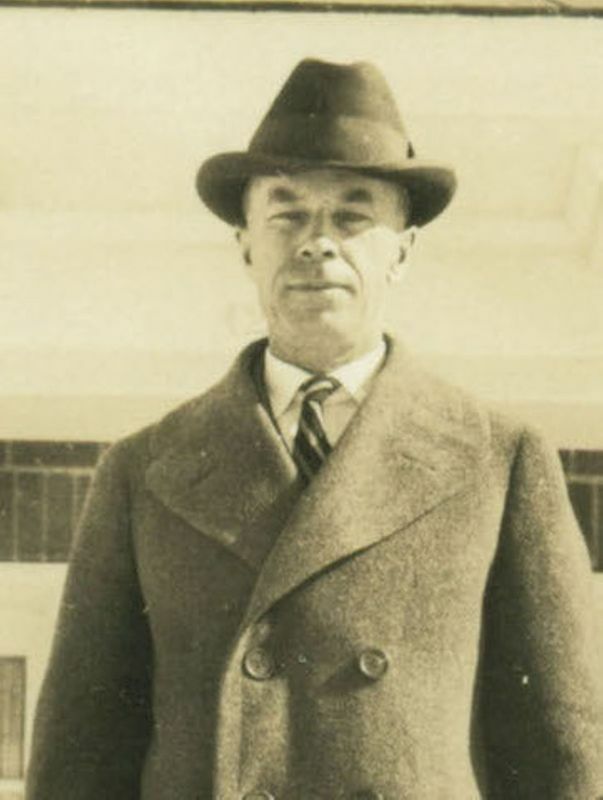 In the 1920s he moved to Illinois to attend college, with the aim of becoming a physician, but he found the cultural adjustment difficult and periodically traveled back to Alaska. 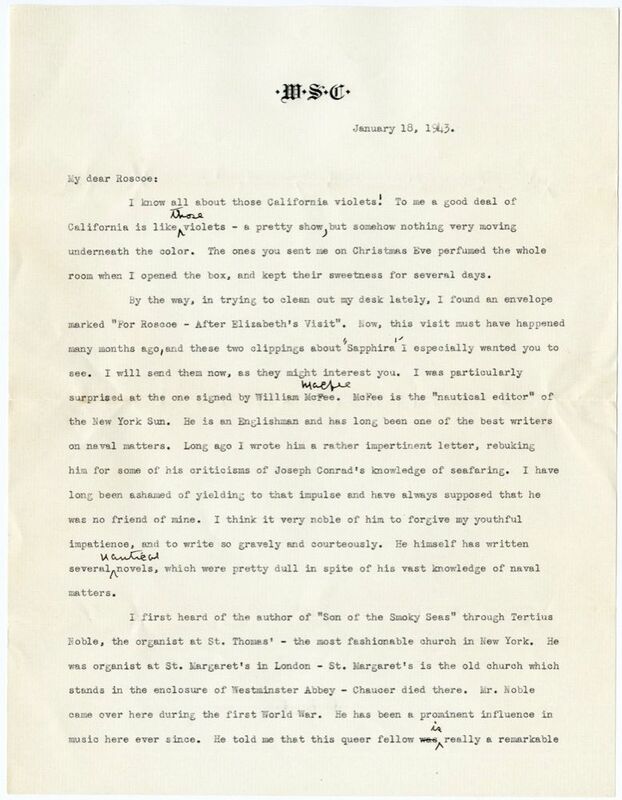 At the time Cather met him in 1942 through organist Tertius Noble, Oliver was living on Long Island, had published a memoir of his childhood, Son of the Smoky Sea (1941), and was making his living as a lecturer and performer. After World War II, Oliver helped to rebuild the Village of Atka in the Aleutians. He died in Spokane, WA. 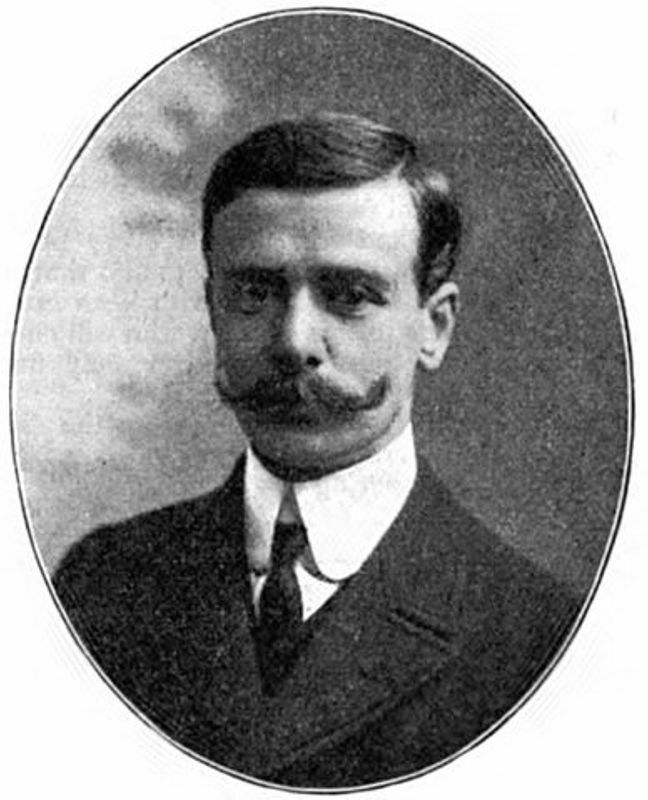 Noble, Thomas Tertius (1867-1953) (“Tertius”) British-American organist and composer. Born in Bath, England, Tertius Noble studied at the Royal College of Music in London, England. He held positions at Cambridge University and Ely Cathedral before becoming choirmaster and organist at York Minster Cathedral in 1898. He married Muriel Maude Stubbs in 1897, and they had one child, Philip Raymond, in 1903. 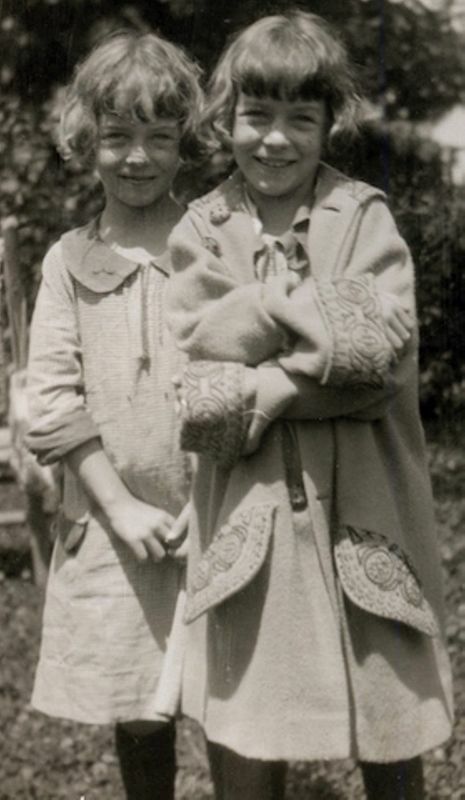 In 1913 Noble moved to the United States to become director of St. Thomas Episcopal Church on Fifth Avenue in New York City, not far from the 570 Park Avenue apartment Cather and Edith Lewis moved to in 1932. Noble established a choir school at St. Thomas in the English cathedral tradition. He composed music in multiple genres, including sacred music in the Episcopal tradition. He retired from St. Thomas in 1947 and died in Rockport, MA. 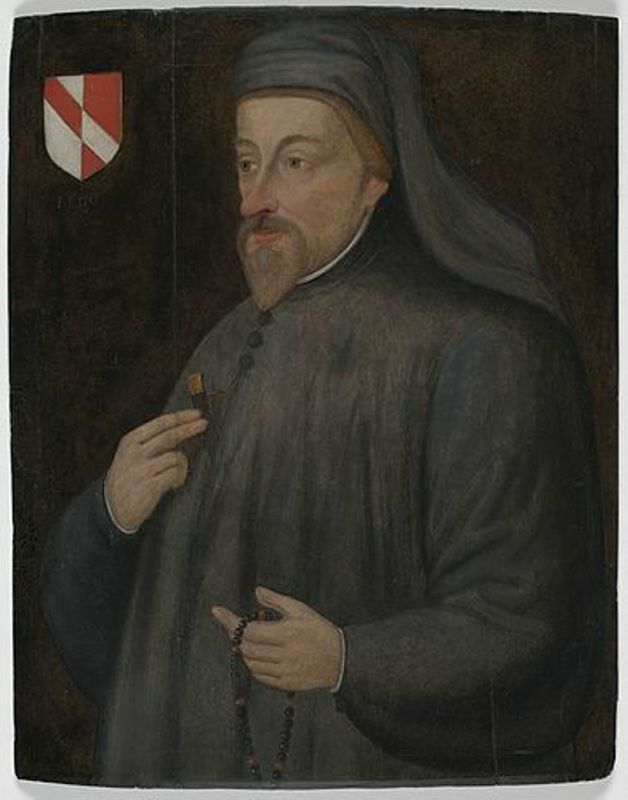 Chaucer, Geoffrey (c. 1340-1400). British poet, author of The Canterbury Tales. Cather does not allude to Chaucer in her fiction, but she reread him late in life while hospitalized and praised his work as intellectual food that made her “want to get well and live" (#1685).